I wanted to take a moment to thank you for your help and support in this critical effort. The Fortnight was a tremendous success, as demonstrated by an outpouring of support from Catholics across the country showing up to pray, study, and take action. 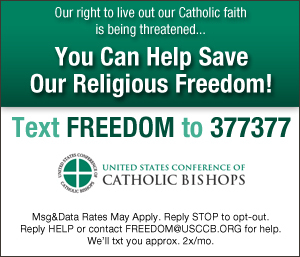 And many of you took the time to connect with our efforts by texting FREEDOM to 377377. . . . In the coming weeks and months, we will continue to keep you updated about continued threats to religious freedom and offer ways you can help. Only through a sustained and conscientious effort will we be successful. Read entire update. Also of interest from Bishop Farrell: "The Church and Politics"
The Civic Action Director manages the Civic Action Ministry to address advocacy and legislative activities. The primary objectives of this ministry are to advocate for pro-life legislation, train grassroots citizens in effective advocacy, and provide voter education. The Civic Action Ministry develops and implements strategies for accomplishing these objectives primarily through public education and interaction with elected officials. Click here to review complete job description. Applicants for the Civic Action Director position must be active members in good standing with their parish/faith community, and must demonstrate belief in and acceptance of Catholic Church teaching, especially on life issues. [Tuesday's] decision by a federal district court in Nebraska to dismiss one of the many pending lawsuits against the HHS abortion-drug, contraception and sterilization mandate is unfortunate (and in one respect, seriously mistaken). But the decision turns on technicalities and doesn’t decide the merits of the dispute. Bear this context in mind if you should hear anyone trumpeting this decision as some sort of “victory” for the federal government on the religious-liberty questions at the heart of the HHS mandate litigation. It’s nothing of the sort. Continue reading. The piece falls short of helping us to make a true acquaintance, glossing over critical pieces of information for anyone who wants to get to know Derzis and what motivates her. The “abortion queen” is no altruistic champion of women. Derzis, quite literally, profits from abortion. And her Mississippi clinic is not the first to face closure for endangering women’s health. Continue reading.